The Adriatic is a simply styled high quality bar stool with all the features you would expect from Lakeland. The seat is made from faux leather, with quilting achieved through horizontal stitching to add detail. It is amply padded and wider than most other bar stools, giving it a luxurious feel. It has a medium high backrest for comfort and support. The central support column, with integral oval footrest, and the circular base have a chrome finish which provides a striking contrast with the seat. 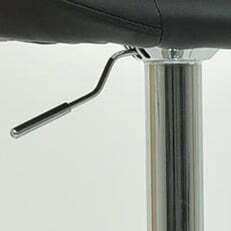 The height of the seat is adjustable within a 20cm range with a gas lift mechanism and the seat swivels through a full circle. The base is fitted with a floor protector to prevent any damage. Suitable for use at your kitchen counter or breakfast bar, the Grey Adriatic makes a strong style statement. Adriatic Bar Stool Dark Grey.